Try our signature, zesty house sauce. Limit 1 per customer. Additional sauce 35 cents. Limited time only. 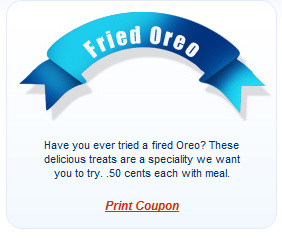 Have you ever tried a fired Oreo? These delicious treats are a speciality we want you to try. .50 cents each with meal.